I realized something today. 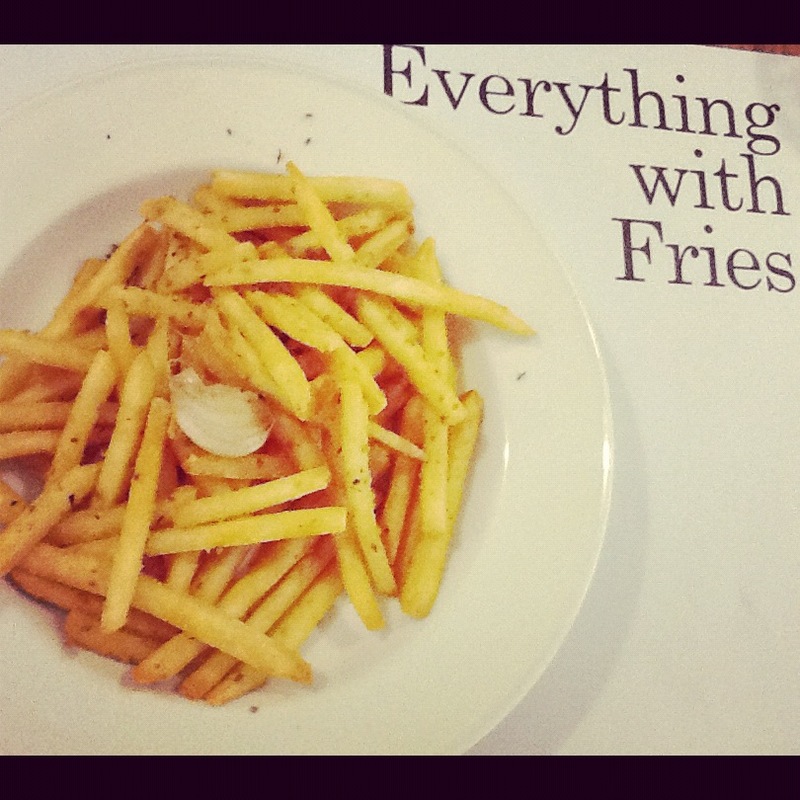 It started with me dragging a good friend of mine to ‘Everything with Fries’ – a nice restaurant where the fries are known to be superb. Never mind that my friend, let’s call her Milou, had just gone to the gym and she might not want to indulge in junk food. As a die-hard fries fan, I was determined to set foot at this restaurant and try out their delicious fries. Being the good friend that she is, she agreed to accompany me. My order of fries arrived and sure enough, it looked good. I snapped a few photos and beamed with happiness, thinking to myself how lucky I am that I’m about to taste the wonderful flavors of these golden-colored fries. And they were not just regular fries, mind you. They were seasoned with garlic and herbs. Mmmmm. My mouth was starting to water. Then I slowly picked up one fry and put it in my mouth. I picked up another, and another, and another. But something didn’t feel right. Or rather, it didn’t feel good. Sure enough, the fries looked great, and they were seasoned well. But to me, they just felt cold and crispy, and I found myself not enjoying them as much as I thought I would. How could this be, I wondered, as I kept stuffing the fries in my mouth, hoping I would enjoy it at some point. I looked around the restaurant and other women seemed to be enjoying their plate of ‘fancy’ fries. Except for me. After quite an attempt on my part, I gave up and said to Milou, “these fries aren’t that good at all. I would eat McDonald’s fries over this any day”. Milou smiled, as if she had already guessed what I was feeling, and said “you see, sometimes you can go for the most fancy, good-looking things, but in the end you might not get that comfort that you get from McDonald’s fries.” I thought about Milou’s wise words and realized how true this is, not only with fries, but men as well. See, sometimes you can be with the most refined, sophisticated, classy man, and not feel good about it even one bit. Sure, he looks good, dresses well, and drives a nice car. He is the man that all the girls would line up for. But somehow, you’re just not feeling it. And that’s absolutely okay. It doesn’t mean there’s something wrong with you for not wanting what everyone else wants. It just means you have a different taste. The kind of fries you like might not be fancy, but for you, they’re the most delicious fries in the world. And that’s more than enough. So forget about what you ‘think’ you should like, and just go with what you like. For me, it’s back to good, old, comfortable McDonald’s fries. For now at least. I like your posts, very witty with a serious message underneath. very nice work. LLet me have the honour to nominate you for the Versatile Blog award. Check out hte deatils here:http://lostupabove.wordpress.com/2012/01/09/the-versatile-blog-award-ii/. I hope you like it.